Australian Industrial Product of the Year Award, presented to Neil Le Quesne CEO & Executive Director of K-TIG (Keyhole TIG Limited) by Chris Barnes of BOC (right). 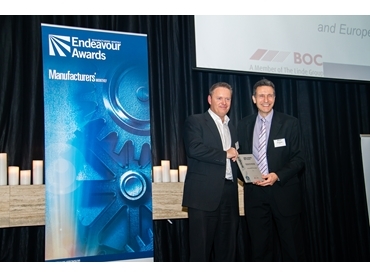 K-TIG, named after the keyhole TIG process it uses, won the Australian Industrial Product of the Year Award at the recently-held Endeavour Awards. The product itself was the result of ten years of research and four years of product trials in six countries. Developed at the CSIRO’s former Division of Manufacturing Technologies, K-TIG is a high speed, single pass, full penetration welding technology that eliminates the need for wire, edge bevelling or skilled operators and produces exceptional welds up to 100x faster than TIG welding in materials up to 16mm in thickness. “K-TIG uses self-induced effects to generate a plasma jet,” explained the company. The keyhole method was was patented by the CSIRO. Trials, including with Samsung Heavy Industries in Korea, formed a big part of the development period. The organisation ended its welding research in 2006 and moved its Adelaide lab to Melbourne. After this, Dr Laurie Jarvis, K-Tig’s inventor at the CSIRO, took the IP back from the research organisation and commercialised it. “The company itself is commercialising some quite incredible technology that’s come out of the CSIRO,” explained CEO Neil Le Quesne after K-TIG’s victory. Profiled in Manufacturers’ Monthly’s May edition, the small company is based in Salisbury, in Adelaide’s north, and expects 2014 to be a major year in its short history. There are major two businesses in the USA - one a household name - who have installed K-Tig’s systems, and the welding technology company believes it has a lot to offer those involved in pipeline welding. It believes that boosts to the speed jobs can be carried out, massive savings and automation benefits would translate into big benefits for companies working on pipeline jobs. “Pipeline welding is an enormous field, with every one of the problems the broader welding industry,” the company’s Belinda Latz told Manufacturers’ Monthly earlier. The technology is also cloud-enabled, and able to record every weld made. Moreover, if connected to the internet, K-TIG controllers update their firmware and software from K-TIG in the background, automatically. K-TIG has been formed with the sole purpose of commercialising the keyhole TIG welding system, and is developing a high calibre international distribution network and has fulfilled orders in 6 countries including Australia, UK, Norway, United Arab Emirates, India and China and will fulfill orders in Malaysia shortly. For all the excitement around what the company currently offers, it insists you ain’t seen nothing yet. “Arguably the biggest innovation is yet to come,” it hinted in its entry. So what is the feeling after the company’s success? What can we learn from K-TIG’s example? And is there reason for the industry to be optimistic? “I think it can,” said Le Quesne. “We’re certainly extremely optimistic from our perspective I think it’s about finding a niche, it’s about finding competitive advantage, and I think it’s about being bold. As well as the importance of pipeline welding in the future, the company hopes to capitalise on the international sales and marketing abilities it has built up. “We’ve pretty much decided that we shouldn’t be limited by the Australian domestic market,” explained the CEO.